We do what we can to help make paying for university easier on you (and your wallet). We offer entrance scholarships, in-course bursaries, and encourage you to apply for OSAP; but we recognize that some students are looking for a way to earn money while they study. Luckily, we offer several on-campus part-time job opportunities – so you can earn while you learn! This program allows you to work on campus and gain hands-on experience while earning cash. It’s also a great way to network and meet people on campus. Visit the Student Financial Services website for details on who is eligible as well as when and how to apply. Our more than 4,000 on campus jobs offer plenty of opportunity for growth, getting involved and skill-building. Whether you’re interested in serving up lattés in an on-campus eatery, helping a prof do research, or showcasing your lifeguard skills at the pool, we’ve got you covered. This program allows you the opportunity to experience Guelph in the summer, while gaining research experience AND earning money. These full-time positions begin in May and typically run for 16 weeks. The application process for this competitive program begins in December of each year so be sure to check the financial services website for details. The great thing about co-op at U of G is that you have the flexibility to find and apply to jobs that suit your program of study and personal interests. While students have the flexibility to apply for jobs across Ontario, out-of-province and even internationally, some students choose to work right here on campus! Visit the Recruit Guelph website for more information on co-op and to check out current opportunities. If you have questions about our Work Study or URA programs, get in touch with Student Financial Services at awards@uoguelph.ca. For questions related to finding jobs on Recruit Guelph contact Co-op and Career Services at recruit@uoguelph.ca. Hey Future Gryphons – we’ve got some upcoming deadlines you’ll want to make note of! This is the form you need to fill out if you to be considered for any needs-based scholarships or bursaries. You can find it on the Student Finance website. If you're applying to U of G from outside of Ontario or are not currently enrolled in secondary school, you need to ensure that your transcript has been sent to us by the deadline. We recommend double checking with your guidance office (or the office from the school you attended). If you are an international student applying from a Canadian high school, make sure your proof of English Proficiency is in by April 16th (IETLS, TOEFL, etc). Check out our International Admission's page for more info! If you want to make changes to our OUAC application (switch rankings, change programs you applied to, etc.) you have until April 16th to do so! You can do this on the OUAC website. This is where you can provide additional information about yourself that can help us make a fair admission decision. If your admission average does not meet the cut-off for your program the SPF can help you be considered for admission if your average falls within 5% of the final cut-off. If you haven’t received an admission offer yet Future Gryphons, FILL THIS OUT. You can find it on our website. Put these dates in your calendar. Get things filled out and submitted ASAP. We’re in the final stretch now Future Gryphons! In December we shared what makes our Bachelor of Science in Agriculture program unique - from being global leaders in education and research to the 4 jobs currently available for all Ontario Agricultural College (OAC) grads. You can find that article on our website. Today we’re getting into the Experiential Learning (EL) opportunities available to our agriculture students. Applied research courses for agriculture students include research projects, independent study courses and special studies courses such as Special Studies in Agricultural Science I and II. These courses allow you to work with faculty to complete a research project or literature review. Agriculture students can also gain credit for being involved with events such as College Royal and the Canadian Agri-Marketing Competition. In upper years of the program, you can take classes such as Animal Production Systems, Health and Industry, Agriculture and Food Issues Problem Solving, Research in Animal Biology, Experiments in Animal Biology and more. In these courses you will benefit from activities like lab work and case studies that will help you build those hands-on skills. Within our Agricultural Science majors there are many opportunities to complete research and analysis in a field location. Examples include a Crop Science Field Trip course as well as a Field Course in International Agriculture. From an animal science perspective, we also offer courses that allow students to visit farms and facilities to assess and “judge” their overall operations for credit! In professional practice courses you will have the chance to shadow an industry professional and gain important skills related to your field of study. For example, in Experiential Education I, you will find yourself an industry placement and work under the supervision of an employer with guidance from faculty. There are so many unique opportunities in our Bachelor of Science in Agriculture program to tailor your education to your own interests and experience working right in the Agriculture industry before graduating. For more information on where our grads have worked, current research and program features, visit the Ontario Agricultural College website today. What’s your favourite memory from U of G? My entire experience as a Gryphon has been my collective favourite memory. Coolest thing about your program & favourite class you’ve taken so far? The best thing about my program is the endless opportunities that students have once they graduate. There are so many avenues you can explore with your degree! My favourite class was ANSC 1210 Principles of Animal Care and Welfare because it helped me realize I want to attend grad school to study animal welfare and behaviour. What’s your go-to spot on campus? Third floor of the UC, in the study cubbies across from student financial services. Are you involved in any extra-curriculars? Always! 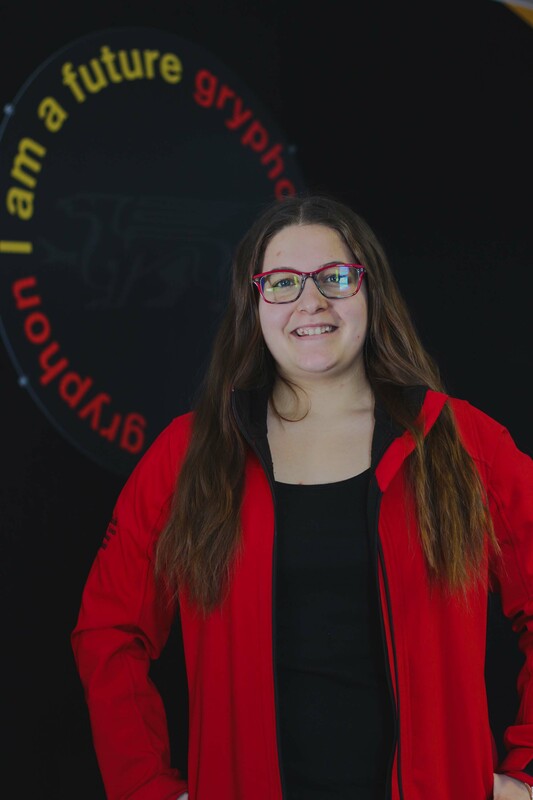 I’m the Treasurer for the Animal Biology Students’ Association, Events Director for Her Campus Guelph, Front of House Manager for Curtain Call Productions and I’m involved in intramurals like volleyball and dodgeball. I also like to take part in events on campus like Tractor Tug for Tots and College Royal (#Aggie4Life). What prompted you to become a tour guide? 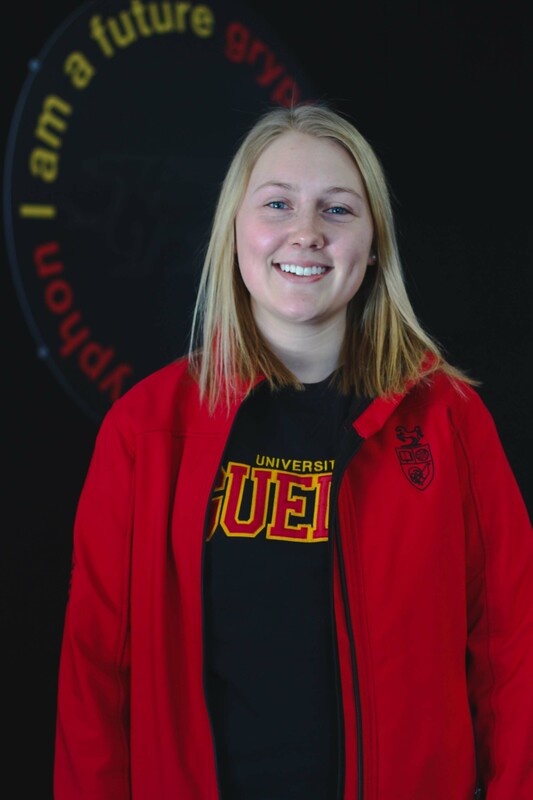 I initially volunteered as a UofG Ambassador and I found I really enjoyed helping students make the tough decision of where to go after high school. What is your favourite thing about being a tour guide/what's the best thing you’ve experienced while being a tour guide? I love highlighting all the amazing experiences that I’ve had by going to university and sharing my school spirit with others. Giving tours makes me feel like I’m making a positive difference in someone’s life and I enjoy helping parents feel more comfortable about sending their child off to school. Why should students come for a tour? To meet our amazing tour guide team! It’s also important to see each of your options in person rather than going based off a website or pictures. There’s nothing like setting foot on our beautiful campus and taking in the community that we’ve made here. What’s your favourite stop/story/fun fact on your tour? My favourite stop is The Cannon because it’s such a unique and interesting part of the university and a fun story to tell! What made you apply & pick U of G? My program at first, but I came for a campus tour when I was in grade 12 and fell in love with the atmosphere! The food, the history and the people all solidified my decision! What advice do you have for Future Gryphons (or their families)? I would tell both Future Gryphons and their families not to stress. I know for students it seems like a huge weight is on their shoulders to figure out the future, but there’s always room to change your mind and follow a different path. As for parents, I know it’s hard to let your child go off to school where you can’t be there 24/7, but this is their chance to grow, to learn, and to figure things out. I guarantee they’ll love their time here! On April 3, a game-changing, $21-million donation from Stu and Kim Lang was announced, taking Business and Economics to a new level at the University of Guelph. In recognition of this generous gift, our College of Business and Economics will be named the Gordon S. Lang School of Business and Economics with a vision to be recognized locally and globally for developing future business leaders for a more sustainable world. Imagine yourself graduating from the new Gordon S. Lang School of Business at the University of Guelph. new resources ranging from innovation and entrepreneurship, to sports business. We’re proud to continue to establish ourselves as a world-leading business school. To learn more, check out the full press release and video on new Gordon S. Lang School of Business. Ever since I went on a tour of the university with my parents in the Fall of 2015 and saw the UofG Tour Guides showing their passion for campus I knew it was something I would one day love to do! After volunteering as an Ambassador to show my residence room in East Residence to prospective students I wanted to broaden my knowledge of campus and show families everything the University of Guelph has to offer (especially the food)! What is your favourite thing about being a tour guide? My favourite thing about being a tour guide is getting to meet so many prospective students and their families. I really enjoy talking with high school students about their different interests to see how they can continue these involvements at the University of Guelph. With it being such a diverse and opportunistic campus, there is always something for everyone to do and the feeling of helping a student connect with that passion is like no other! BEST spot on campus? Why? Creelman Dining Hall is by far the best place on campus! The food is unlike anything I have ever tasted, Mom’s Kitchen’s chicken pot pie being my absolute favourite. The staff there are so friendly and take the time to learn student’s names, checking in with them during busy times of the semester like during midterms. Creelman has a different menu every single day and the weekly themes keep me coming back to try new foods and enjoy some classics almost every day. If I’m not there for lunch, you’ll find me there at dinner time! The best way to see if the University of Guelph is right for you is to come for a campus tour! See if you can picture yourself on campus, taking notes in one of our lecture halls, eating a plate of homemade lasagna at one of our dining halls, and making lifelong friendships while living in one of our residences! We’ll show you what life would be like here and what will best suit your needs and interests as a university student. Any advice to incoming students (or their families)? My biggest piece of advice would be to talk to as many people as you can throughout university. In residence, in your classes, through extra-involvement clubs or colleges, there are so many wonderful people at the university of Guelph that can teach you incredible skills, lead you to great opportunities and become some of your best friends moving forward in life. I realized in university just how important having support systems are, so I really encourage incoming students to make the most of their time at the University of Guelph and connect with others! I try to be as involved on campus as possible! I have been on the University of Guelph’s Relay for Life committee for the last two years, where we run a 12-hour overnight fundraiser to raise over $100,000 each year to support cancer patients and fund lifesaving research through the Canadian Cancer Society. I am also the Co-President for the Me to We club on campus where we fundraise for children and families in need overseas by running engaging events on campus! Lastly, I volunteer with the Child Care and Learning Centre on campus, helping toddlers learn and grow through play and building relationships with others. My favourite story to tell on campus is when I take my tour group to the Gryphon’s arena. It seems like such a small spot on campus from the outside but when I was in first year everyone on my residence floor would go skating here on Sunday afternoons and then fill up on Tim Horton’s hot chocolate. We taught our one friend how to skate here, since he was an international student and had never tried it before! Learning new things and making friendships that will last a lifetime are two things university has taught me to cherish and for that reason this special place on campus continues to remind me of that. My favourite memory is living in the East residence Leadership House in my first year. We were all students that had been quite involved in high school and wanted to continue helping others in any way we could! We attended events together, volunteered on campus, and went out for floor dinners which all allowed us to become close friends. Now almost three years alter I consider these people to be my best friends and people I look up to everyday as they lead others on campus and make huge differences for our students. I owe it all to Leadership House for bringing me these wonderful people and experiences! Biological science gives you the freedom to take any science courses of interest to you, they can be from many different disciplines! Having many interests within the sciences make this flexibility perfect for me because I have gotten to take some really unique courses like Vertebrate Zoology, Discovering Biodiversity, and Epidemiology! My favourite class so far was a first year seminar class called Human Animal Dynamics, where we looked at the relationships between humans and animals through documentaries, group conversations, and self-reflective writing! My favourite memories are all of the fantastic events that I have helped run for BAS students at U of G. In particular, the bi-semesterly trivia nights that we host in the Brasstaps. It’s fantastic for such a diverse group of students to come together as a community. Trivia night is certainly an event that BAS students look forward to! I also am very proud of the interdisciplinary conference that we hosted here in January. We had students coming from all over the world to take part and tackle complex problems together! This is such a hard question for BAS students! If I had to pick, my favourite thing about the BAS program is how diverse we all are, and yet how well we are able to come together and really use our different areas of expertise to solve problems. I have friends that are in the BAS program doing drama, music, mathematics, and marketing – all subjects that I know very little about! I probably have two favorite ‘classes’, though I have enjoyed so many here at U of G. The first is the independent research project that I took on in my third year where I examined the medical community in the 1800s and their interaction with demonic possession, Marian apparition, and stigmata. My second favourite class is a seminar that I am currently in where we are looking at the history of scientific racism, as in the ways that science has created the concept of race and perpetuated the idea that races are biologically different from each other and that some are superior to others. Both of these classes are specific to the BAS program, which has allowed me to really connect with other BAS students! If I had to pick one, I would likely say the BAS lounge in the Mackinnon building. However, there are so many fantastic spots on campus that I prefer to constantly find great new places to study, meet friends, or grab a bite to eat. Yes! I have been involved in the Bachelor of Arts and Sciences Student Association (BASSA) for most of my time at U of G. I started out in a very small role and then became the President in my third year. This past year, I have also taken on the role of President for the organizing committee of a conference that we hosted here at U of G, focusing on interdisciplinary cooperation and education. I am also on the curriculum review committee for the BAS program, which has been a great opportunity to advocate for students and to learn more about how higher education is organized. I have also worked as a research assistant, as well as being a tour guide this year! In addition, I am a member of the horticulture club. Getting involved on campus is a great way to build your own community of people who are passionate about the same issues that you are. Some of my best friends have come from these experiences! I am originally from Vancouver Island, B.C. The first time I ever stepped foot on the U of G campus was the day I moved into South Residence! I was so nervous moving across the country without knowing anyone in Guelph, never mind not knowing what the campus community was like. I know that if I had been able to come for a tour, some of those fears would have been eased. I became a tour guide so that I can help prospective students gain some of the confidence that I didn’t have coming to U of G.
My favourite thing about being a tour guide is seeing on a daily basis how friendly and welcoming the U of G campus is. People on campus, both friends and strangers, always smile and greet tour groups as we go by. I love being able to play a small role in helping students make the decision about where they are going to spend the next four years of their life. Students should come for a tour because it really is the best way to get a feel for the campus community at U of G. Plus, you get to chat to a current student, which is a great way to figure out what being a university student is all about! I picked U of G 100% for the BAS program. I stayed because of the sense of community that the campus has. There are so many clubs and initiatives to get involved in; there really is a place for everyone! My advice is to ask questions and get involved! There are so many opportunities available at U of G, sometimes all it takes is a conversation with a professor or a fellow student to find something that really sparks your interest. *Follow 'uofgadmission' on Instagram to watch Solveig's full interview on IGTV. There are so many favorite memories I have from U of G! I’d have to say one of the best memories was painting the cannon, a.k.a Old Jeremiah, in my first year with my residence floor! There is a lot of history and tradition here at the University of Guelph and meeting up with fellow gryphons, camping out until sundown with cans of paint, painting our creation on the cannon, camping out until sunrise the next day to guard our painting, and ultimately take part in an ongoing tradition that was established over 65 years ago is definitely an experience I’ll never forget! Definitely the coolest thing about my program would be the wide range of courses that I can take that all seem to focus around my general interests in the health field. I’ve taken courses that range from molecular and cellular biology to pathology of disease to biochemistry to pharmacology, to human physiology to human anatomy and so many more. My favorite course I have taken so far in my undergrad would definitely be my Human Anatomy dissection course. Having the opportunity to apply what we’ve learned in our anatomy lectures to various human cadavers in our dissection lab, is a way of learning and discovery that goes far beyond what any textbook can teach. Working alongside small groups and passionate technicians I’ve been able to view the human body and anatomical concepts in a whole new depth and this experience has influenced such a greater appreciation and respect I have for those who donate their body to science and education. My go to spot on campus would have to be The Bullring. The Bulling is a student run coffee shop/pub that is very central to campus and a lot of my classes so I always find it pretty quick to access, especially during the cold winter months. The food is AMAZING at the Bullring and very reasonably priced. Their homemade mac and cheese is definitely one of my favs! I also love the relaxed vibe and great music they play at the Bullring, and their open mic nights every Wednesday is definitely a fun time! Yes I am! Along with being a Tour Guide, I’ve been a student ambassador and Orientation Volunteer for 2 years and I’ve volunteered with the Guelph Relay 4 Life committee as well as the Human Anatomy Outreach program. I’ve also been involved in various intramural sports, such as girls volley-ball, co-ed multi-sport and co-ed bubble soccer and I’m also on the Gryphons Powder Puff flag football team. Prior to choosing U of G, I toured various schools and spoke to various tour guides, and what stood out the most about my Guelph tour was definitely the enthusiasm and passion that my tour guide had for U of G. I remember vividly my tour guide sharing not only the amazing features that Guelph had to offer, but their personal stories and memories they created on the campus, as well as their love for the close-knit university community, and friendly vibe that spread across campus. 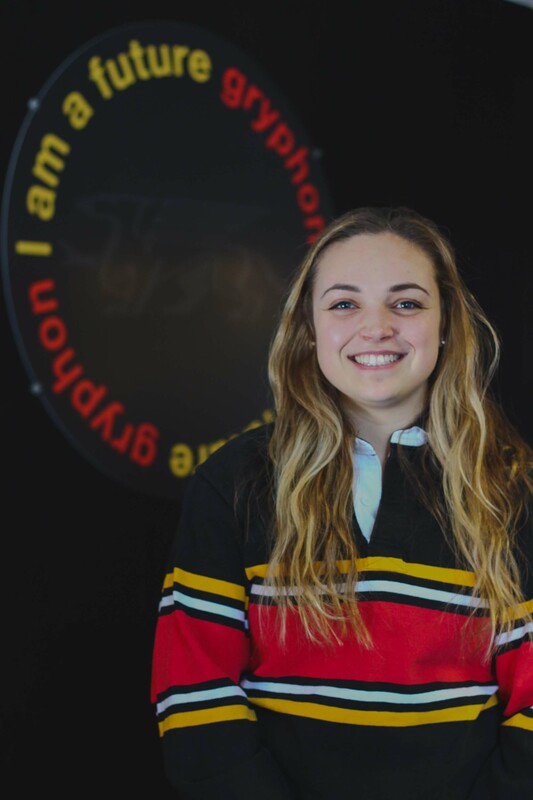 As a visiting high school student, hearing those personal experiences and reasons why my tour guide personally loved Guelph, definitely influenced my decision to come here and within the first few weeks of being a Gryphon, I knew that I too wanted to show off the school that I came to love to other incoming students and make as much of an impact on them as my tour guide did on me. One of my favorite things about being a U of G tour guide is making those initial connections with visiting students and their families and seeing their interests and curiosities about U of G instantly grow throughout the tour. I love sharing the attractive features of the University of Guelph, along with my own fun and humorous stories involved with being a Gryphon. Along with emphasizing the University of Guelph, I also enjoy sharing tips and advice for students choosing a school and going into the first year of university in general. 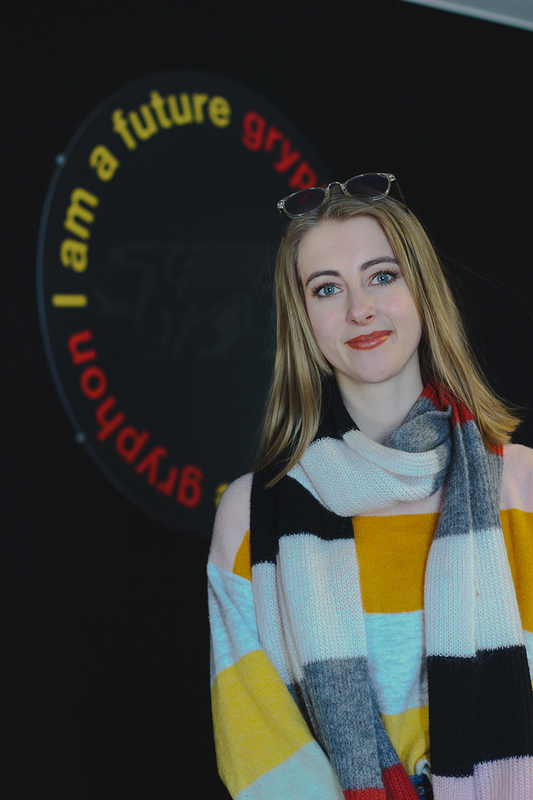 I know when I was coming into first year, no matter what school I was going to choose, I had lots of questions about how to prepare and what to expect. On my tours, I really enjoy helping students gain a bit more insight and relieve some of their stresses by giving them tips and advice on how to prepare and make the most out of their university experience. Students should definitely come for a tour of the University of Guelph, as this is the best way to truly feel the friendly and relaxed vibe that the U of G students and university community portrays. By coming for a tour you’ll get to not only experience the campus and the beautiful buildings, but you’ll also get to meet some pretty cool Gryphons who will share their personal experiences and reasons of why you should become a part of the Gryphon family. I would say my favourite stop on my tours would be the Athletic Centre. As soon as we enter the building, the students and families are always amazed by the size and architecture of the building, and the rock climbing wall always gets the group pretty excited too. I also love seeing the range of expressions I receive when I explain my experience working in the human anatomy lab, as a lot of people are usually shocked and intrigued that this is offered at the undergraduate level. I picked U of G for many reasons, but I truly love the size of the campus and the friendly community vibe I experienced throughout my visits. I loved the passion that the students I connected with had for the school and I was definitely interested in the unique courses that were offered throughout my program. I also love the amount of nature and greenery that spreads across our campus. My advice would be to get involved with whatever interests you at U of G. Joining academic/extracurricular clubs, sports teams, organizations and various councils are all great ways to meet new people and provide a great outlet from your studies. Also, time management is key in university. Being able to distinguish when and what you’re going to study can definitely decrease stress levels when assignments and midterms start to build up, and meeting with a peer mentors and various other services offered here at Guelph can help you with this skill. Lastly, don’t hesitate to go to professor’s office hours if you have any questions about course material, upcoming exams or university in general, they are all very welcoming and friendly people and a great way to make connections for any future research or volunteer opportunities. Back in December we told you what our Bachelor of Bio-Resource Management (BBRM) degree program is all about. If you missed that article, check it out on our website. As a refresher, in BBRM you have 3 majors to choose from; Environmental Management, Equine Management and Food Industry Management. Each of these majors are very different from each other but their experiential learning opportunities fall under the same umbrellas which we’ll break down for you now! Courses such as Advanced Independent Research and Research in Food Science are available to students within certain BBRM majors. Courses like these allow students to conduct research under faculty guidance in an academic or industry setting. Our Food Industry Management major within BBRM offers a co-op option for study. Co-op placements are good for networking, skill development, gaining hands-on experience, and a great way to try out different work environments to see if you could work in that industry in the future! Visit recruitguelph.ca for more information on co-op at U of G.
Environmental Management students can take a course in third year where they will work in teams on an integrated project creating a detailed environmental report with policy recommendations and action plans. Equine Management students have exclusive access to upper year courses with integrated experiential learning including Equine Event Management I & II, and an Equine Integrated Project. In these courses you will get the chance to work with and learn from industry professionals and world-renowned riders. Within our BBRM majors there are many opportunities to complete investigation and analysis in a field location for full and partial semesters. Visit the BBRM website for details on the opportunities available in your major. As with all our degree programs, students in BBRM have plenty of opportunities to get involved and gain beneficial experiences outside of the offered courses. This could include exchanges, volunteer opportunities, field trips, clubs and student organizations, work-study placements and many more. To name some examples of organizations you can join we offer a University of Guelph Wildlife Club, an Outdoors Club and the BBRM Student Council. To learn more about how to get involved as a BBRM student, we recommend visiting the BBRM website and checking out their featured student profiles. Be sure to check out our Experiential Learning website for more information on EL at U of G.
What’s your favorite memory from U of G? When my friend decided to teach me how to ice-skate and I first got on the ice and was frazzled by the gliding and balancing motion on the ice. It was a hilarious evening for both my friend and me. Coolest thing about your program & favorite class you’ve taken so far? In one of my microbiology and genetics courses I got to work with DNA and tag it with a fluoresce gene in order to make it glow in the dark. Creelman and the Library Starbucks! 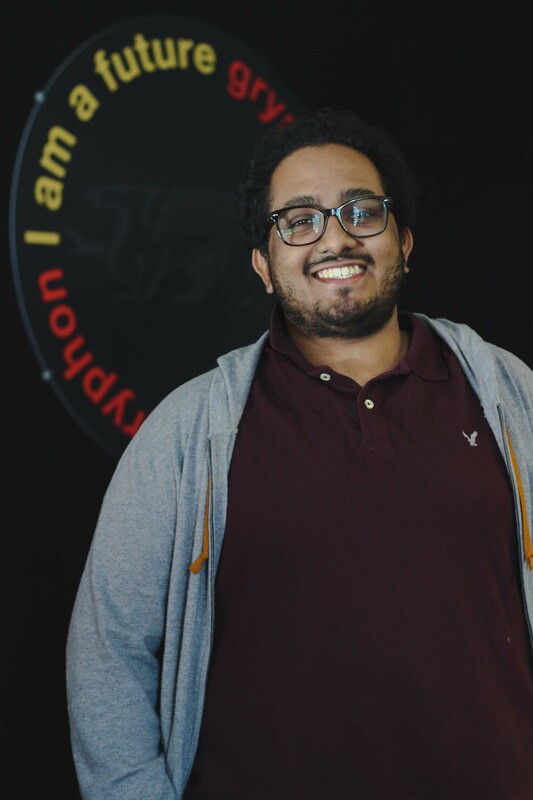 I have been working for the University of Guelph and volunteered for Orientation week for the last 2 years, as well as volunteering as a big brother with the Big Brothers Big Sisters of Guelph. I wanted to show-case my love for the U of G, while sharing my experience and advice with incoming students. What is your favorite thing about being a tour guide/ what’s the best thing you’ve experience while being a tour guide? My favorite part is helping prospective students picture their life at U of G and hearing the hilarious stories their parents have to share about their time at university. I have many hilarious stories to share both from my time at the University of Guelph and anecdotes from Alumni. What’s your favorite stop/story/fun fact on your tour? Johnston Green is one of my favorite spots because I have so many memories with my friends there, including hanging out on the green listening to live music during gryphfest and putting hammocks up in the trees and studying with my friends. The campus life, the countless opportunities available and the people at U of G had a huge impact on my decision, as well as the classes that are offered in my program. You should get as involved as possible while you are at university. It will allow discover so much about yourself as well as develop new skills and meet incredible people.